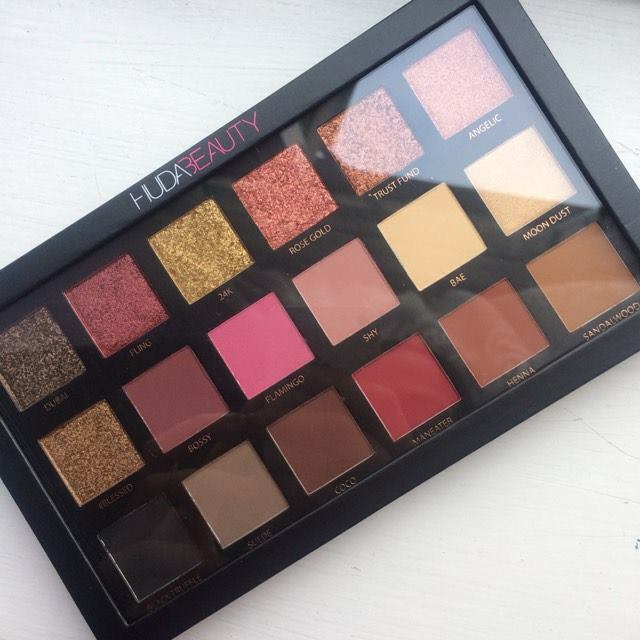 The Huda Beauty Textured Shadows Palette Rose Gold Edition (£56) was one item I was dying to get my hands on the second I heard of its existence. Sold on Cult Beauty for £56, I can't deny that the price certainly made me double take. I did my research, I watched a myriad of YouTube reviews, mostly negative if I am honest but this palette just wouldn't quit playing on my mind. So in spite of the high price I bought it and decided to make up my own mind. I want to get straight into the review, so the first thing most comment on is the packaging i.e. it's cardboard, cheap-looking and mirror-less. While I agree that for the price I do expect more, the packaging certainly fits in with the aesthetic of the rest of her line. I quite like that you can see the shadows through the clear plastic top as I feel the actual shadows are the selling point of this eyeshadow palette i.e. the colours and unique finishes. It is slim, cardboard, but so far for me it travels well and protects the shadows decently. Let's talk about the big issue of cost. In total, you get 18g in an 18 shadow palette, so that is 1g per eyeshadow. For reference, the ABH Modern Renaissance Palette is 0.7g per shadow but is less expensive. To put things in perspective, one eyeshadow in the Modern Renaissance Palette costs approx: £2.92 and one eyeshadow in the Huda Beauty palette costs £3.10. The difference, when broken down, isn't that much. It is the most expensive palette, eyeshadows or otherwise, I have ever purchased so I don't think it is unreasonable to expect a little more from this palette than others. The actual eyeshadows themselves are interesting, it is a Textured Shadows Palette with a total of three different finishes: 6 3D Metals, also known as the "Textured" Shadows which are Dubai, Fling, 24K, Rose Gold, Trust Fund and Blessed; 2 Chromatic Pressed Pearls which are Angelic and Blessed; 10 saturated mattes which are Bossy, Flamingo, Shy, BAE, Black Truffle, Suede, Coco, Maneater, Henna and Sandalwood. The metals are advised to be applied with a finger, I have seen many use them with a brush but I do prefer applying them with my index finger. All my swatches are done on dry skin, one swipe with my finger. I don't use primer or a brush and I don't swipe more than once. 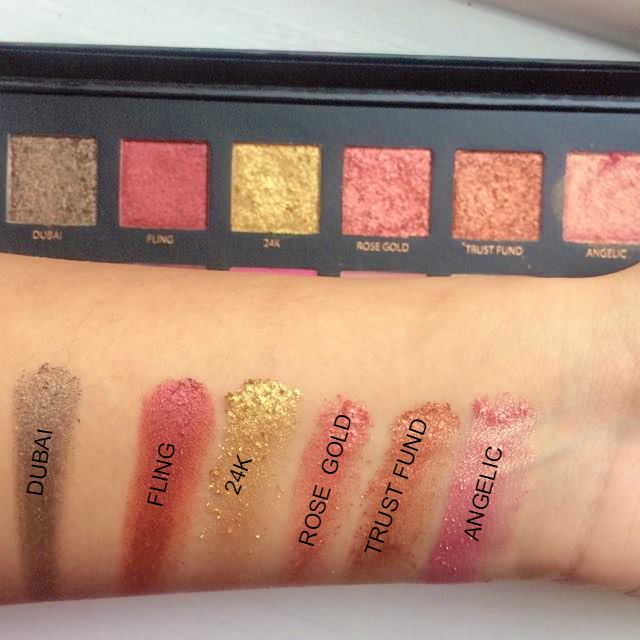 Dubai (smoky bronze), Fling (sparkly cranberry), 24K (lavish gold), Rose Gold (rose gold, surprisingly, reminds me of pink lemonade), Trust Fund (golden copper) and Angelic (sweet pink with gold reflections). In these six, there are 2 finishes. The first 5 are 3D Metals and the last is a Chromatic Pressed Pearl. The only shadow out of these that I had trouble with is 24K, with the 3D metals I find patting with your finger applies it best, dragging it loses some of the pigmentation. I love all these colours, the only one I don't see myself getting a lot of use out of is Dubai, but now I think it would look gorgeous in a dramatic dark smoky eye. Fling, Rose Gold and Trust Fund all look quite similar in tone and I wish there was more range because I don't think anyone would use more than one textured shadow in a look. I will see how they layer and update this post. I do really like the concept of these shadows, I don't think they're all that unique as they remind me of most pressed pigments except they are more gritty to the touch which I guess is what makes it "textured". I don't think the inclusion of such shadows will be a hit for everyone, but if you love eyeshadow then these might be for you. In the second row we have: Blessed (vintage gold), Bossy (a maroon clay), Flamingo (bright pink), Shy (dusty pink), BAE (cream) and Moondust (astral gold illumination). I much prefer Blessed to 24K, it's such a beautiful gold and the mattes in this row are so smooth and even, not patchy at all. They all apply and blend effortlessly, they aren't as shockingly pigmented as most people probably want but overall I was impressed with the matte and chromatic pressed pearl formulas. 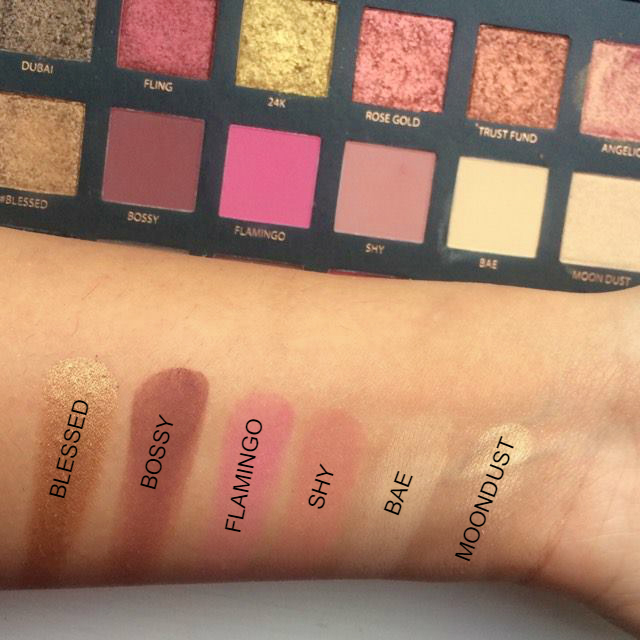 I like all the shades but if I had to pick I think Blessed, Bossy and Moondust are my favourites in this row. 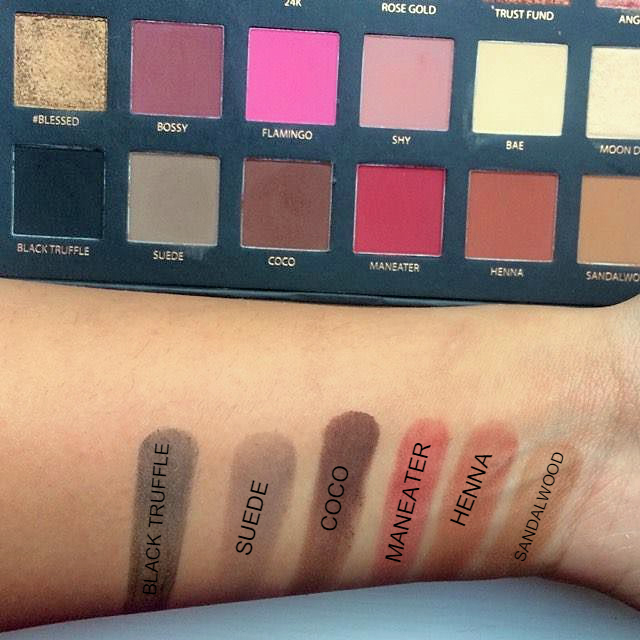 The last row is full of mattes, the 6 mattes are Black Truffle (black), Suede (grey), Coco (deep brown), Maneater (mulberry), Henna (warm reddish brown) and Sandalwood (deep tan). I find that overall the formula is good, they blend nicely and are evenly but not ultra-pigmented. Apart from Coco and Maneater none of them are very rich and shocking in colour but this does mean they are really easy to use on the eyes. I know a lot of people will be put off by how Black Truffle swatches but I actually like it. It works great as a deepener (in the outer corner) without instantly making a huge mess of all your hard work like other super pigmented matte blacks and if used wet it still works as a decent liner. Sandalwood and Henna are the standouts for me as they are warm in tone and work beautifully in the crease with most looks I do. 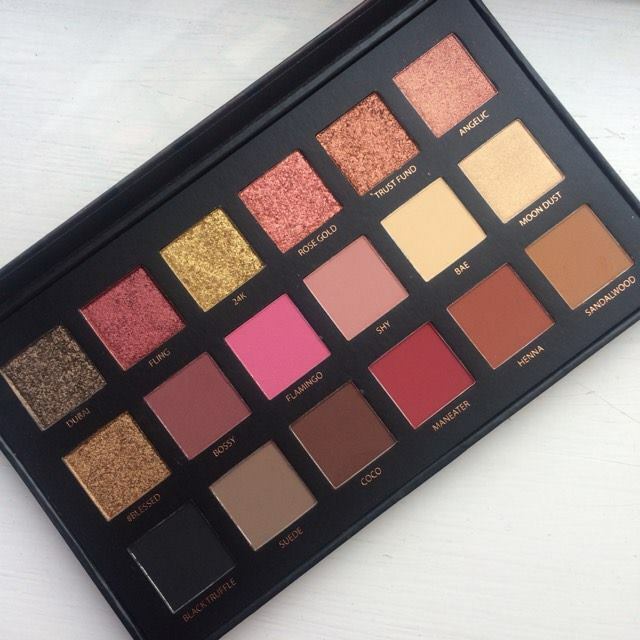 To summarise, do I think this palette is worth the hype? I really do, just the fact that you get so many colours and create so many looks makes it worth it to me, a self-confessed eyeshadow junkie. Do I think it's worth the price? Probably not, if I am honest if you calculate how many eyeshadows you will actually use. For me, I love to experiment and try new things with eye looks so the choice is definitely a good thing but if you like your eye makeup to look a particular way and are put off by anything too glitzy then I wouldn't recommend this palette to you. The mattes are beautiful, in my opinion, they are some of the smoothest mattes I have ever felt and they don't have much fallout. Overall, it is a well-designed palette with a great selection of colours, all of which do complement each other. I look forward to her future palettes and hope she chooses less common colours as I think the warm burgundy tones are certainly being done to death this time of year. 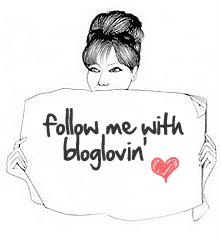 Let me know what you think in the comments, I would love to hear your thoughts. This is just my opinion, I don't regret buying this palette but then eyeshadow palettes are my kryptonite. Thank you. Take care. What is the most expensive makeup you have ever bought? I would expect Black Truffle to have a little more pigment, but I do think it's worth a try despite the price - lovely review! I have been really curious on this one, so I'm glad you shared it! Love the colors of this palette! So beautiful! OMG! Trust fund and rose gold look so gorgeous! I love metallics! I love the colors in this palette! They are so perfect for the season! Wow they are definitely quite expensive. I loved your review. 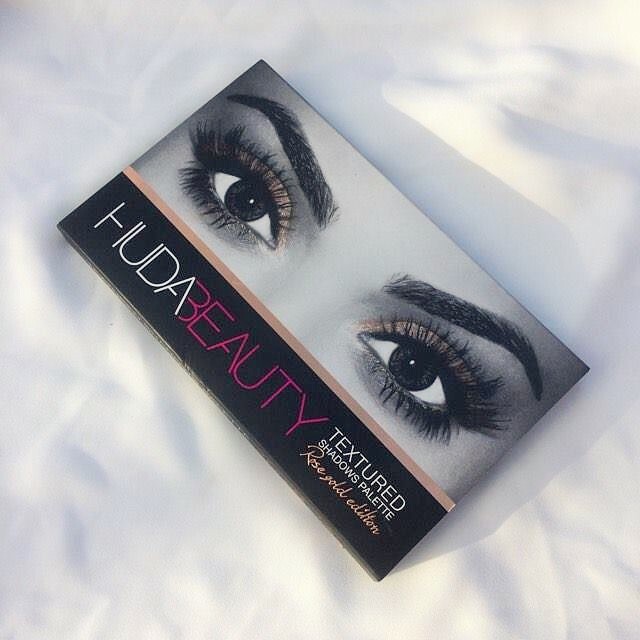 It will definitely come in handy if I come across this product and the shades are very lovely. This is such a great review! I wasn't tempted by this one as its too warm for my liking but it does seem a little expensive overall! The first row of shadows are just absolutely stunning! This is such a beautiful palette. 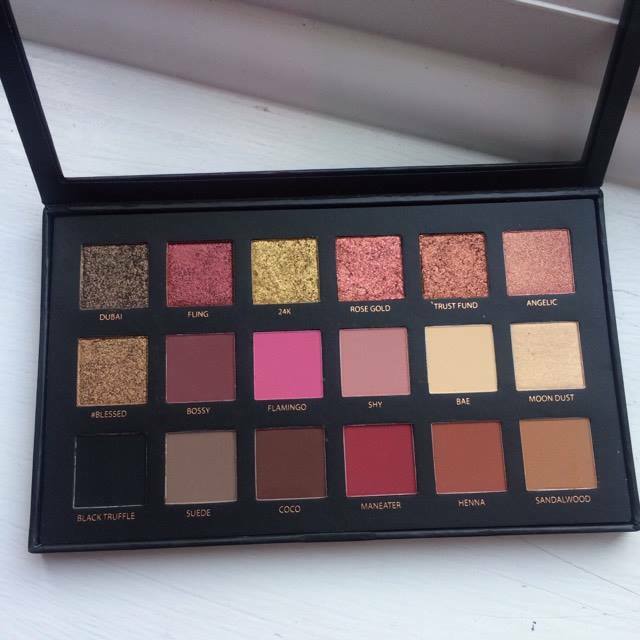 It sort of reminds me of the ABH Modern Renaissance palette because of the shades. Great review! I definitely prefer the look of the matte shadows over the textured ones. The textured ones are wayy too glittery for my taste. But the color Blessed is so pretty! I agree that it looks nicer than the 24K. Yeah I think that would be off-putting for a lot of people, it doesn't look horrible on the lids. I don't really have much expensive makeup, I tend to spend on skincare. I think my Estée Lauder Double Wear foundation was the most expensive purchase last year. 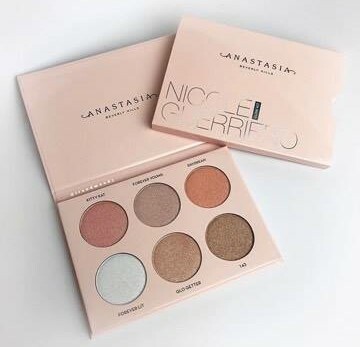 I really want this palette, it looks gorgeous!! I really did want this palette but considering the price and the quality of everyone's swatches I've seen and that applying any eyeshadow with my fingers just kind of grosses me out I have had to decide not to get it. I wanted to get it and love it so that's a bit sad, it does look so beautiful but I can't really afford to buy it unless it's like, bloody amazing! Looks like such a lovely palette! Thank you for the honest review, Kiran, I was looking forward to reading your thoughts on this! I am giving this palette a pass, mainly because for that price I expect it to be perfect instead of having to work with some of the eyeshadows. Thank you for your honest review - it does look amazing but I just don't think I could justify the price tag! 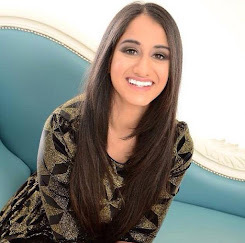 Loved your review Kiran! So through and detailed.. I thought of getting this but I have hooded lids and I have such bad makeup skills so I feel like this would be a waste of money..